This evening I did a bunch of garden-related things that had stacked up. Yesterday after work I stopped by a nursery and bought a bunch of annuals (on sale!) 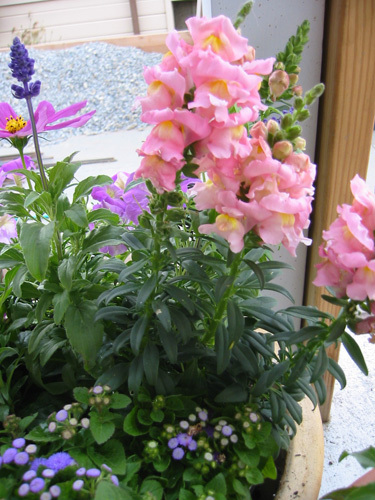 to plant in our large containers for the side porch. I also bought some peat pots and seed starter mix. It all really started in November, when we got this nice big bunch of grapes from the store, and they had seeds in them, and we wondered if they would sprout. 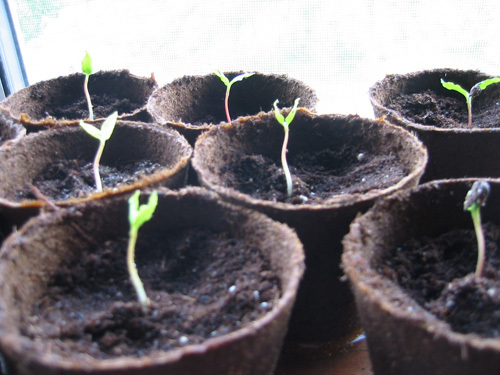 So following some directions we found on the web, we put them in a baggie of moist peat moss in the fridge for a few months, until a month or so ago, when I planted them in a couple of pots to germinate. I didn't think much about spacing, figuring half or more would not sprout, but it seems that every one of them has sprouted, so last night when I got home with my booty, I potted the larger ones up into their own pots. Grapes don't generally grow true to their parents, so we're panning to grow these guys out and see which ones we like. The rest we can give away or compost or whatever. Of course, it's a multi-year undertaking; we should not get real fruit from them for at least three years. We'll see how many of the roughly twenty seedlings make it that far. 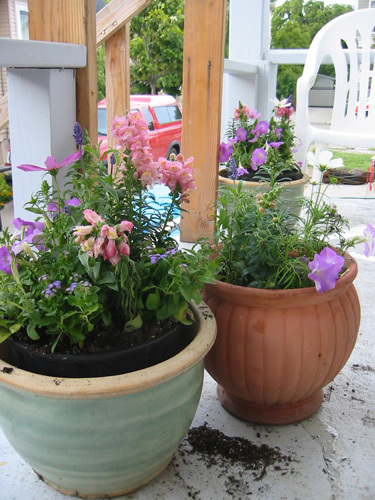 This evening, I potted the flowers up in some of our containers. I overbought, so I ended up with three containers of flowers, but they look quite nice and when the plants grow larger they are going to be totally out of control. Noel specifically asked for snapdragons, and he never asks for anything in the garden (except the pepper plants and a coffee bush) so I bought pink snapdragons. I'm fond of them, as well. There's also some salvia, and petunias, ageratum and cosmos. Very pink and purple.